Billy the bookcase says hello. Augmented reality has sometimes seemed like a solution in search of a problem. But two new apps suggest some degree of utility. And as Google struggles to convince people they want Google Glass, smartphones and tablets are proving just fine for occasionally overlaying visual information on an image. Via The Verge, who note that part of what makes this possible is that the images in the IKEA catalog are themselves already virtual models. Both apps are the work of the same studio: Metaio is a design house specializing in AR apps. Based in Germany, they develop their own apps but also claim 50,000 developers and 1000 apps using their own development platform. The SDK is free to try (with a watermark) but will set you back 2,950 € before VAT. What you get from the platform once you cough up the dough is fairly substantial. You get Android and iOS support on mobile plus Mac and Windows desktop app exports, a drag-and-drop visual creator, image and object recognition (as seen in the Audi app), and cloud-based data updates (again, allowing the Audi app to work without manually updating the manual). For lots more on what Metaio is up to, they’re on Pinterest. Projection mapping, without the projector. 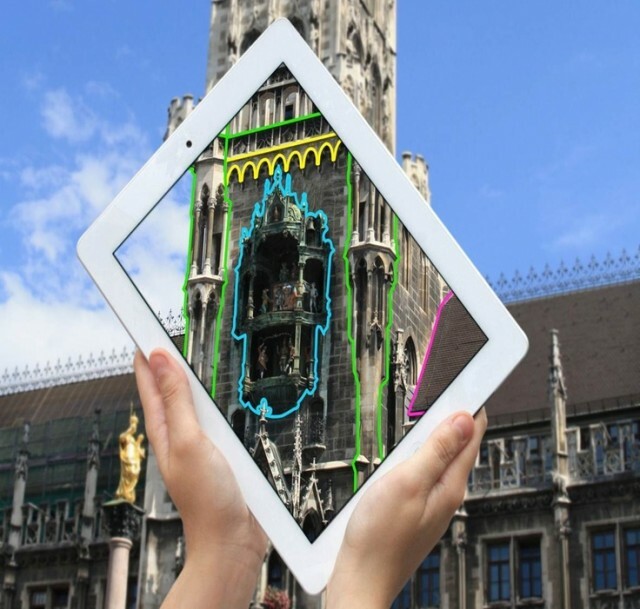 Metaio shows off their tech at Munich’s Marienplatz. Photo courtesy Metaio. Will Wright … says he doesn’t actually want to augment his world in the technical sense. As it is, the world provides too much information, says Wright, and he’d like to cut down on the clutter and improve the signal-to-noise ratio. And that’s where the Audi app shows the most promise. Wearing goggles on your face may not catch on, and we’ve already seen strange gimmicks that, like the 3D glasses included with comic books back in the day, do little to increase the value of paper. But stuck on the side of the road, you might like your iPad to help you work out what’s under the hood of your car. And with so many Android and iOS gadgets out there, people don’t in fact need hardware: they just need a use case.